The smell of bananas, pineapples and kiwi fills the air in the first step within Cali Shakes’ doors. 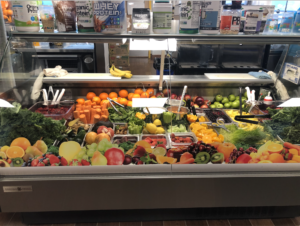 Although opened earlier this year, California Shakes & Fruit Bar brings a healthy and nutritional food option to the Glassboro community. Located right on Delsea Drive near the Rowan campus is a small white building with a large colorful surf board with “Cali Shakes” written on it in fun letters. From the first moment that I walked through those doors on Monday, March 4, I was blasted into a summer oasis, despite the cold night. 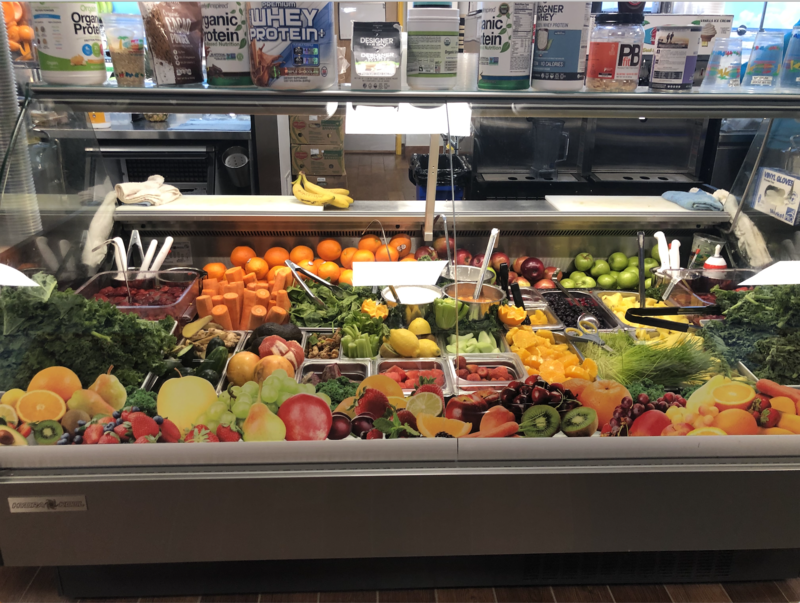 With a painted beach scene splattered along the walls and a large clear display counter right in front loaded with colorful fruits. I was a little caught off guard with the display of protein powder jars lined up on top of the display, but thought little of it. As I stood analyzing the menu, I started becoming overwhelmed with options. I could have a juice called Orange You Glad with turmeric, ginger, carrot, apple and orange, but I don’t even know what turmeric is. Is it a powder? A liquid? Will it give me super strength or energize me all day? I could go simple with just a strawberry, banana and blueberry shake or I could go crazy and pick the wildest option there is. There were so many drink options that it made my head spin. Not only did they have juices, but they had smoothies, milk shakes, Cali energy bowls, custard cups and coffee. 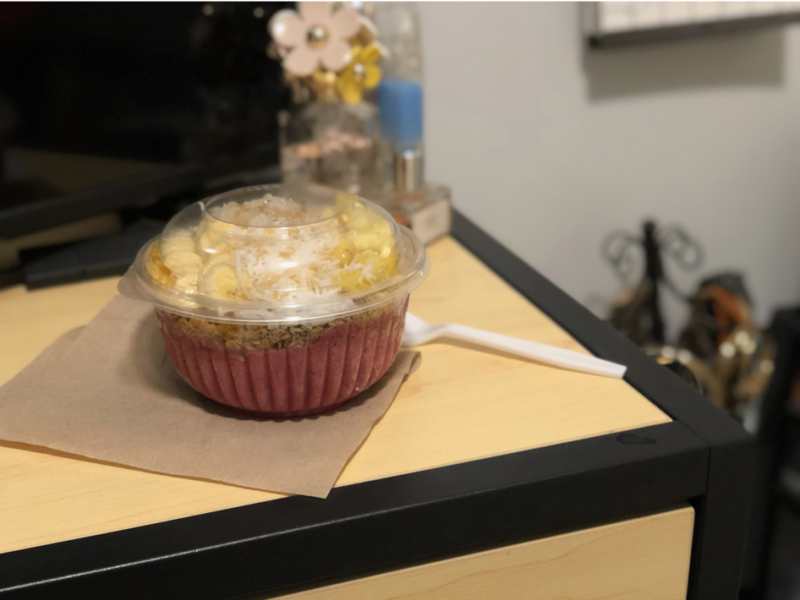 Considering it was 6:30 at night and I hadn’t eaten dinner yet, I went up to the counter and asked person behind the counter for a pitaya bowl called the Perfect Swell ($8.52). It came in a medium sized plastic bowl with pitaya, pineapple, banana and coconut flakes all topped with granola and a drizzle of honey. After she took my order she politely asked whether I wanted more coconut flakes, peanut butter, Nutella or guava on top, to which I answered no to all because peanut butter on top of pineapple doesn’t sound good. She handed me a medium white paper bag, thanked me for my purchase and sent me on my way. Driving home, all I could think about was how excited I was to eat this bowl, how it was going to taste so good and there’s no way to feel bad for my unhealthy splurge at lunchtime because i’m eating so healthy for dinner. 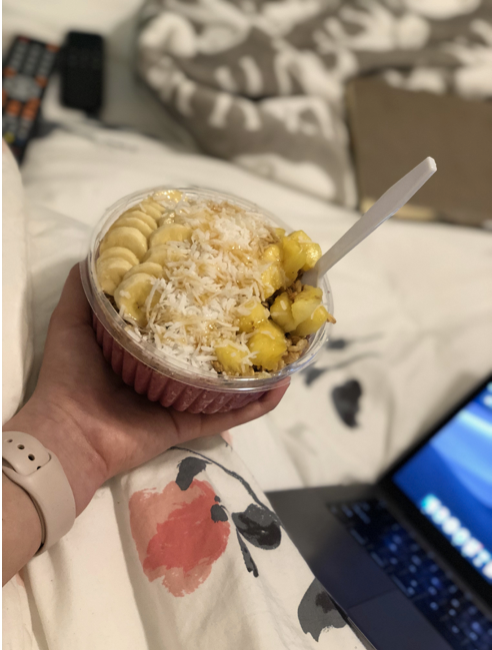 As I got home and broke into my little bowl of nutritional goodness, I thought about how this is almost exactly like Playa Bowls, but a little cheaper. I was told that I was getting coconut flakes, which made me think of hard crunchy pieces, but it was really shredded coconut rather than flakes. They was soft and stringy and there were A LOT of them. I’m not a huge coconut fan, but I typically like the flakes, which these were not. Despite there being an abundance of coconut shreds, the amount of fruit and granola in the bowl balanced it all out. The banana was perfectly ripe and the pineapple was deliciously sweet, giving my tastebuds the perfect zing as I ate. Going in the middle of winter may not have been the best option but come summer time, this place will definitely be a hit.